A friend sent me a private message, saying that she hadn’t heard of Craftsy before reading about it in my blog. She suggested that I give more explanation about what it is and how to use it, which I am delighted to do! 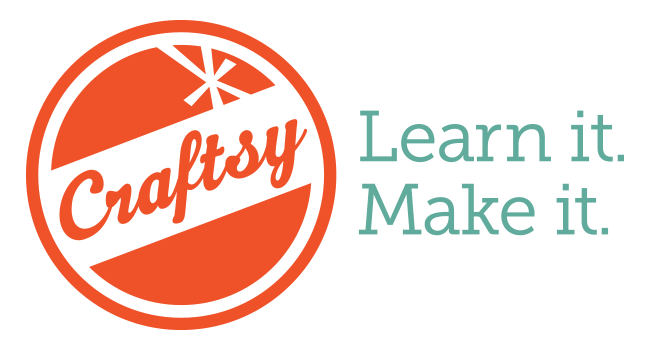 Craftsy has only been around for a scant three years, so what is surprising is not that someone wouldn’t know about it, but that so many people DO! 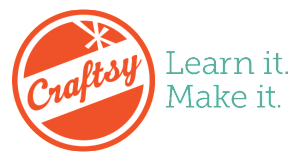 Craftsy is an on-line platform for learning about all types of crafts – fiber arts, cooking, painting, photography, cake decorating, home and garden, paper crafts…the list is extensive. Classes are divided into lessons, which can be of various lengths, but generally less than an hour long. So you can do the class in short bits, if you are time-crunched. There are written materials you can download, and most classes I have taken are project-oriented, so they come with patterns or recipes. They are easy to follow, and you can re-watch, bookmark, or make notes, or fast-forward anytime, as much as you wish. Once you enroll in a class, it is yours forever. The first class I took was Rigid Heddle Weaving . The class was great, but even now, when I need warp my loom I first pull up the class. Then I go to my bookmark for warping, and do it along with the instructor, Angela Tong. Along the side of the screen are questions that students have asked, and you can click to see responses from the teacher and fellow students. It is a very interactive model, giving the students and teacher the ability to communicate with each other without traveling – whenever they want, and wherever they have access to the internet. When I teach a class, in person, I get to watch the students try new things, and give them immediate feedback. In my DVD’s for Interweave, I was able to show knitters how I do things. But Craftsy allows me to have the best of both worlds. I am knitting along with them, they can upload photos of their work, and we can interact in the forum. Honestly, this is my dream come true as a teacher. Once I became an instructor I started taking more classes on Craftsy, to see how they were done and observe other teachers so that I could do a better job myself. Now, I can’t get enough Craftsy. I’m taking classes on things I never thought of doing, and am learning lots of interesting things. I took the Paper Arts class, and although I dearly hope that Alton Dulaney never sees a package that I have wrapped, because he would faint with horror – I was sincerely impressed with the serious artistry involved with Alton wrapping a box, and was thoroughly entertained. Everyone I met at Craftsy during filming is completely committed to doing excellent work, and having fun. When I said that I fell in love with them , I wasn’t kidding. I’d go back in a heartbeat, so watching the classes that they have created holds special meaning because I know all of the work that has been done behind the scenes. The creator of Craftsy, John Levisay, said in his (really terrific) interview on Fiber Hooligan that the Craftsy motto is “it’s better than free”, meaning that they have to compete with YouTube. And yes, it certainly is! But don’t think that you need to spend money to get value on Craftsy. Two of the best classes I’ve taken are free, Complete Knife Skills , and Perfect Pizza at Home These are great first classes to take, because there is a tutorial with them on how to use the site. If you want to explore Craftsy, a good place to start is by entering the contest to win my class, FREE. The next thing I suggest is to check out the Craftsy blog. There is always interesting stuff on there, and it could be on any subject. There can be no creativity without play. Classes are a place to play, where there is no pressure to finish something, no expectation of perfection, no deadline. Taking a Craftsy class in something out of left field ( “French Pastry Shop Classics” ?) is a really fun way to spend some time. Even if you don’t make any croissaints, I promise that you will have a new appreciation the next time you are in a bakery. Don’t forget to post a Comment on the Miss Babs Yummy yarn post! You may win more than enough Yummy Toes sock yarn to knit the Astoria Sock, from “Annetarsia Knits”! Added 5/20/14: “Next Steps in Intarsia is now LIVE. The lucky winner of the Craftsy give-away is gamulholland@juno.com. Congratulations, and see you in class! Thank you so much for the Craftsy explanation. I had no idea so many classes were available. I am enrolled in two classes right now and finding them very good. Great format!